This was the first year that I’ve lived in Phoenix that all the saguaros blossomed with white crowns. So this is the first year I’ve seen so many white blossoms all turn into juicy red fruit. An animal must have eaten some of this one! Check out the bird sitting on the top. Birds seem to love saguaros. Here’s a good article about the harvesting of the saguaro fruit. A couple of the cacti in our yard, thanks to the gardener. One of the most inspiring people in my life has been a gorilla–namely, Koko, lover of cats and poet of sign language. Sadly, she died last week at age 46. This image by a fan of Koko was shared on Koko’s Facebook page with a request to share it, so here it is. RIP dear Koko. I just don’t understand how little her death has been on the news. The people whose lives we celebrate on national television when they die have not done as much for our future and our planet as Koko has done. #amwriting #writerlife #writerslife I had two beautiful acceptances this week. One publication coming out in a day or so . . . .
After last week’s Phoenix excursion and the second hummingbird baby flying off into the big world, we took a drive up to the Lower Antelope Canyon to see the stone sculptures. They are on Navajo land outside Page, Arizona, right near Lake Powell. This area is actually out in the middle of “nowhere,” from the point of view of someone with celiac, an auto-immune disease. In this case, you know I am talking about the gardener. No offense to anything else about the town, but you don’t want to get stuck in Page if you have celiac. While we were there I found an old blog post someone had written about just that issue. There is supposed to be an Italian restaurant that serves actual gluten-free food, but it seems pretty apocryphal to me. It was closed for the season when that blogger visited (three years ago), and it was closed on the day we tried to go (Monday). Using my gluten-free app, we drove from place to place–and each restaurant was closed. And to tell you the truth: they didn’t look like the sort of places that would be genuinely gluten free. So we went to the only grocery store we could find. Since we had no microwave, I figured I would find some tuna salad for the gardener. Even the tuna salad had wheat flour in it!!! I bought some tough-as-leather chicken pieces and a tub of potato salad that I thought was just awful (tasting as it did of sweet pickle relish), but the gardener was satisfied. We tried two restaurants at the Lake Powell Resort and Marina while we were there. Both times he was glutened, probably by cross-contamination. To see the stone sculptures you have to take a “hiking tour” through a Navajo company. I was worrying that my foot would develop a sudden, intense pain, as it occasionally does, and that I would hold up the group or at least the gardener. I needn’t have worried about too much walking. It’s not much walking. Instead, if I had known what it was I probably wouldn’t have gone. You go down into the canyon via stairs, ladders, and walking very narrow, very rocky trails. I am afraid of heights and am claustrophobic, but those problems were nothing compared with walking on narrow rocky surfaces. My reconstructed foot is very fragile. I need a flat enough surface to put my foot down in order to put my weight on it. Otherwise, the rebuilt navicular bone could crack. My tone would be different in this post if that, in fact, had happened. But the only reason it didn’t is because the gardener, with his bad shoulder, had to hoist me through these narrow tunnels so that my weight would be on him instead of my foot. I was super careful how I placed my foot each time. Now that I have come through on the other side completely whole, I can say that I am so glad I did it. I wish everyone could see these beautiful natural artistic canvases of rock and light. This one gives you the perspective of how far down we were. That afternoon we were exhausted and went on a cruise of Lake Powell. The way to do Lake Powell is to rent a big houseboat with a large family and/or friend group. Get one with a slide and grill! And explore all the northern canyons. When the kids were in high school, we rented a boat just like that in Lake Mead (closer to Las Vegas and near the Hoover Dam) and took their friends with us. It was such a fun family experience. Though these lakes are sort of “sister lakes,” they are quite different. Many people prefer Lake Powell, but it is more solitary and Lake Mead has more of a sporting lake feel to it. No, zero writing went on this past week. Lots of Perry hugs, though, when we got home. In fact, all the cats were so happy to see us walk in the door! 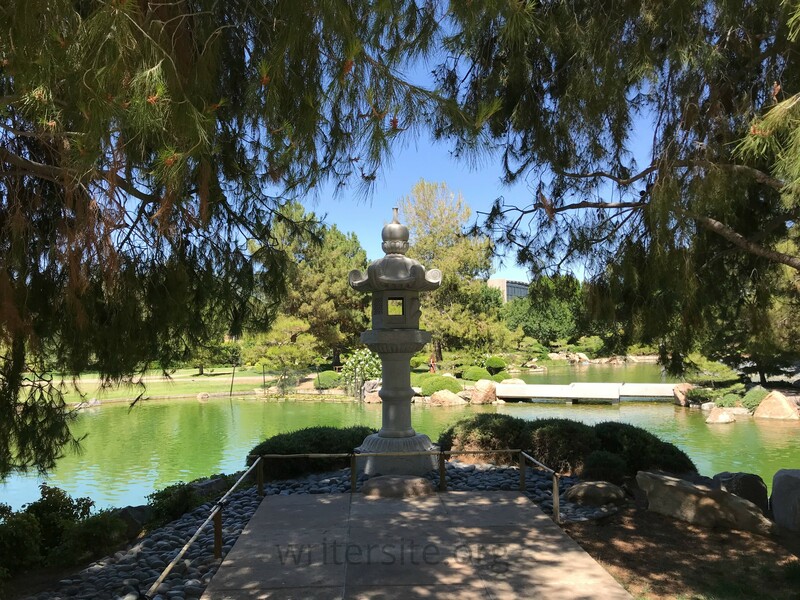 Recently the gardener discovered the Japanese Friendship Garden of Phoenix: RO HO EN. We visited the other day for the first time. 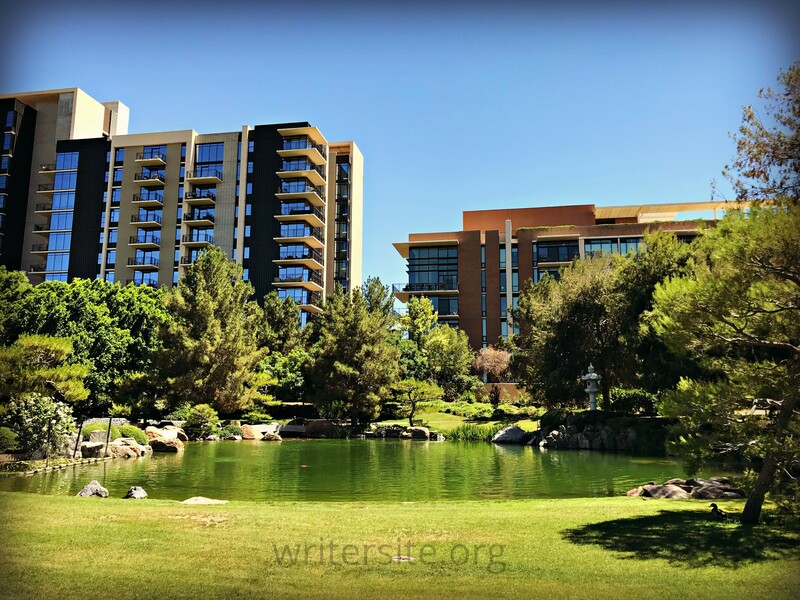 I was so taken with the size of the pond, and this spot of beauty nestled under the tall condo buildings near the Central Arts District (theatres, museums, opera, and arts schools). If you haven’t been to that area, it’s a must see–so active and vital. The garden resembles a lovely park more than it does a Japanese garden of the sort I am used to (Portland, the Huntington, etc.). They offer tea ceremonies to the public on the third Saturday of every month. The fee is $30 ($25 seniors). Imagine living in one of those condos with a view of the garden all year round. 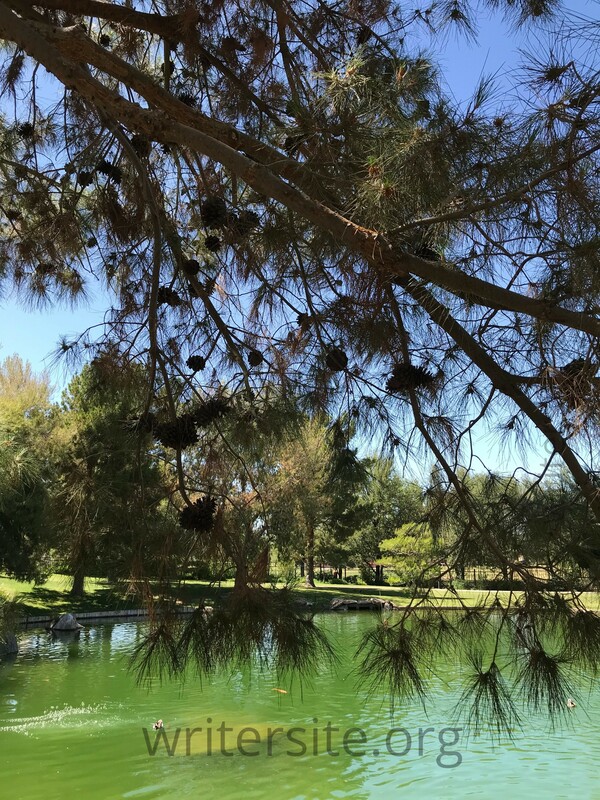 The pine cones were fun because they aren’t a common sight in Phoenix. The park did not have flowers or too many bells and whistles, so the gardener was not impressed with that aspect. For me, the park-like environment was fabulous. But it did come with a $7 price tag ($6 for seniors, $5 for students, and free for little kids). 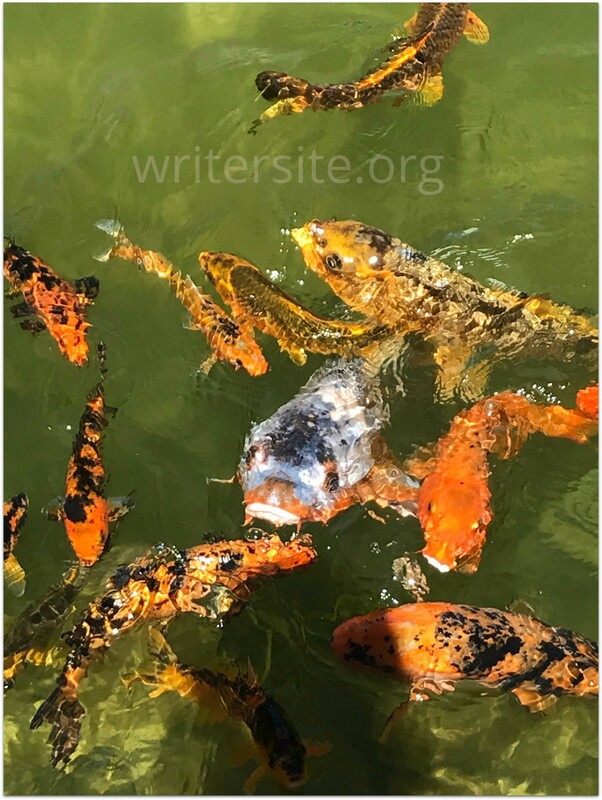 The pond is loaded with giant carp, and when you check in they ask if you want to buy a little bag of food for the fish. The way they all gather to eat a few crumbs was a little terrifying for me. I thought it might be stressful for the fish. 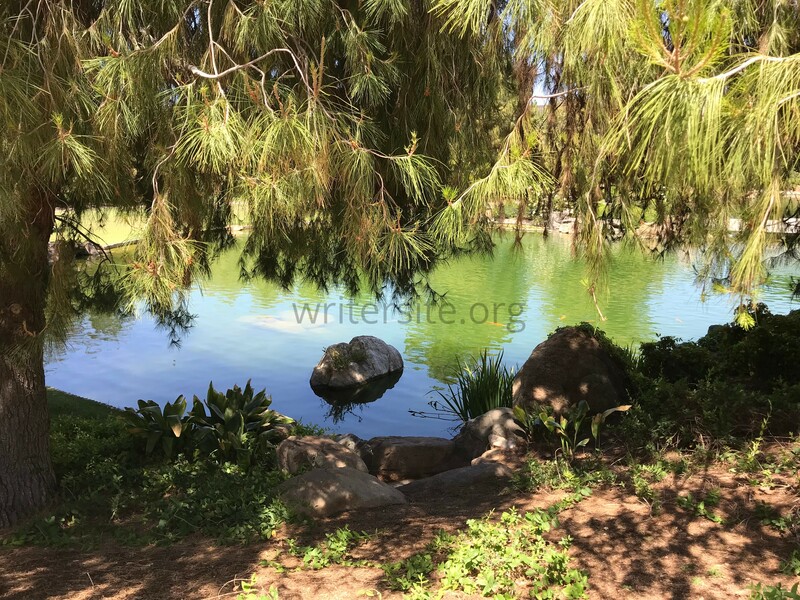 The upside for them is that the pond is so big that their environment is better than that of many pond-living carp. This big guy in the middle was truly enormous. Ducks live at the pond, too, and the mothers all were watching over their ducklings. One duckling imprinted on us and tried to follow us until we discouraged her. This is a short video of a baby duck, just in case you want to see cute right now. 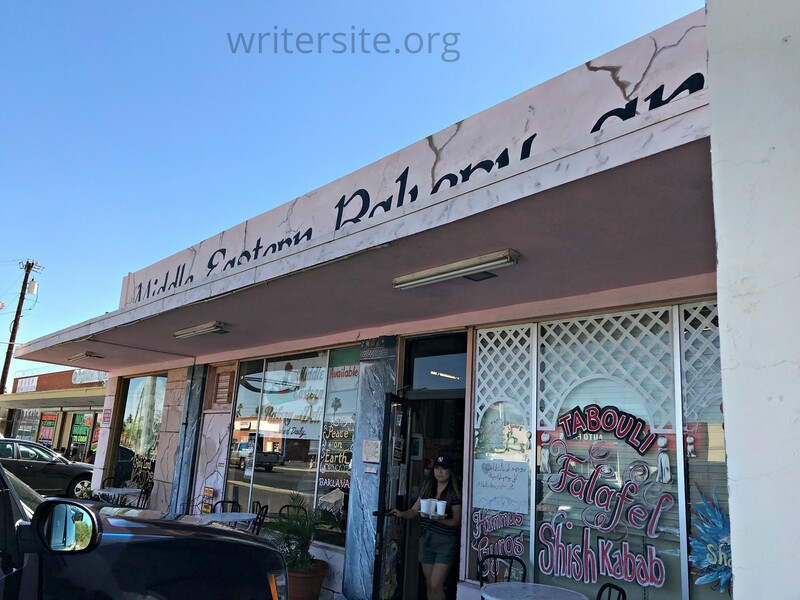 After the garden, we went to one of our favorites, Middle Eastern Bakery & Deli. The owner Isam is so nice, the gluten-free options are diverse (pita, tabouli, and more), and the Lebanese lemonade to die for. This time a tray of turnovers sat on the counter. They looked intriguing. Isam told me that he makes them for Ramadan every year. He is Christian, and though he makes them on behalf of his Muslim customers, he admits to loving them ;). He explained that on Ramadan, because of the fasting, people need the quick energy this sweet treat provides. He said he starts with a pancake and fills it with a cheese or walnut filling, turns it over, and deep fries it. It’s then covered with a rosewater syrup. I cannot tell you how much I LOVE rose flavored food and drink. I keep two bottles of rosewater in my fridge! 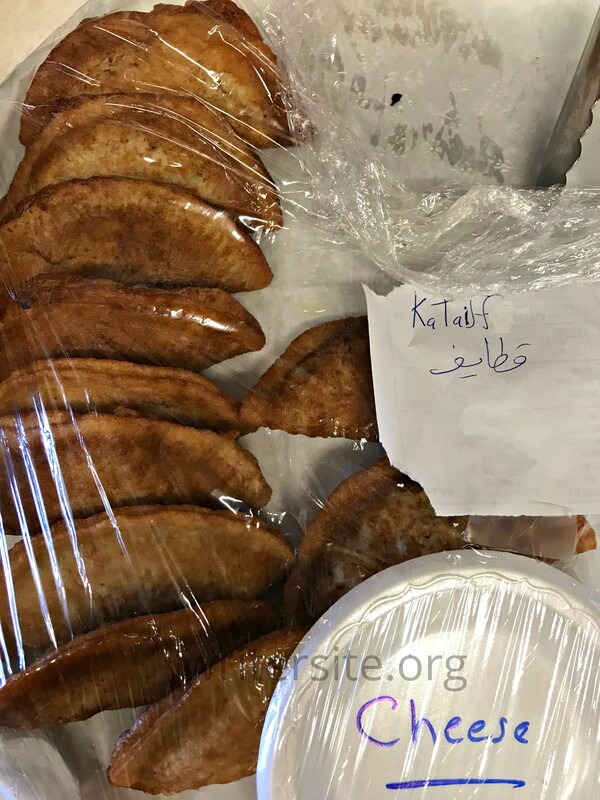 I brought home two kataif–a cheese and a walnut. The gardener told me I was consuming 1,000 calories each. Hahaha, I just grinned as he was saying it because these are obviously not a gluten-free treat! Now for an update on the hummingbird mom and her babies. They are growing up so fast. The gardener watched one fly away already. 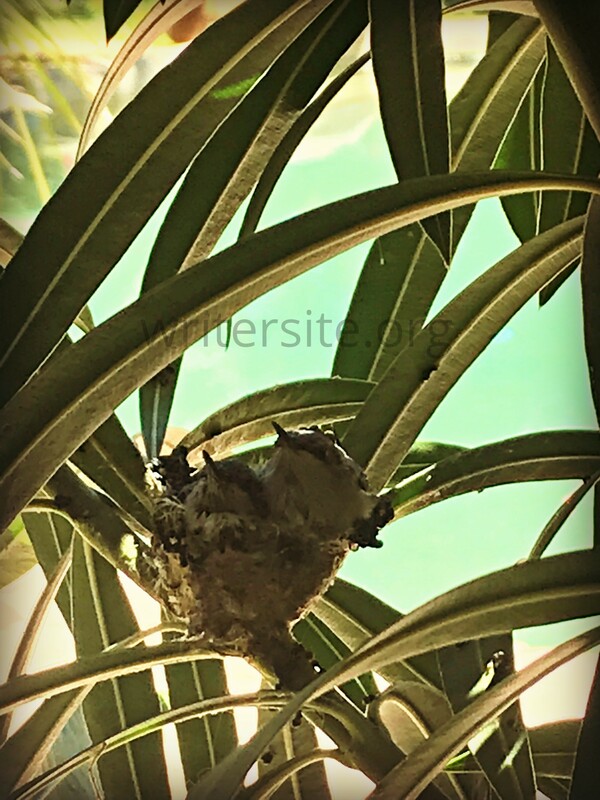 I wonder if their mother is the child or grandchild of one of the hummers who hatched in our backyard a few years ago. Since I restructured my memoir, making it more of a hybrid genre in structure and style, I have debated adding a few poems to the book. This week I revised a couple of poems I am contemplating for the book. On Friday I had some medical tests. I’ve been having some shortness of breath problems. I went to the doctor months after I should have, but I doubt it matters. I now suspect it is more of that acid reflux problem! Probably getting into my lungs. But my doctor thought he heard a new heart murmur so I had to take some tests. I’m sure it’s because my mother had a TAVR last summer. She was so lucky to do so well because she had more wrong with her heart than people usually do who get TAVR procedures. This is less invasive than open-heart surgery as they “go up through the groin.” My mother is now the darling of Spectrum Hospital in Grand Rapids and is featured on billboards throughout the city. She’s so darn cute. Tell me if she’s not adorable. I’m not worried about my tests because I have seen how bad this acid reflux situation is. I have a splint thingie that I am supposed to wear at night for my TMJ problem, but the acid has eaten through the acrylic!!! I go to Mayo Clinic in Arizona because, why not? One-stop shopping for medical. They take my insurance for which I worked my TUSH off by teaching for a pittance for all those years. (If you think I am exaggerating, you would be wrong. Lecturers or adjuncts or freeway flyers, which is what I was, do over half the teaching work in most universities and get paid a tiny share of what professors make. People who clean houses–and do not need high school diplomas–get paid more per hour than I did with my P. H. and D. No kidding again. But I will say I did it with love). What I noticed at Mayo this time was a preponderance of beautiful art. I hope that somebody loans or donates it to them because I would hate to think that my insurance and my deductible and all is paying for that art. Beautiful Chinese jade pieces, well-made Native American pottery, you name it. They are in glass cases, so I couldn’t really photograph them because of the reflections. But I will admit that I feel better getting poked and prodded in an artistic and serene environment. Art calms my soul. Kind of like cats do. The best part of the day, though, were the therapy dogs. I saw three! And they were all beautiful dogs. One a big blondie, another a golden of sorts, and the third? Here he/she is! What is that noise I’m hearing? Is Kana in a kitchen cupboard again? [Leaves to go check.] OK, I let her out. Here is my writing update. If I don’t write one day, I try to make up for it the next. This weekend I worked on a piece for a book that someone else is writing. The book is about the beautiful old lakeside park and dance pavilion that my great-great-grandmother’s niece owned and that my father bought from her on a land contract . . . for a time. Since those years of my childhood stimulated my imagination, it’s a story I’ve been writing and rewriting as poetry and prose for years. I had a nonfiction story taken by a magazine I was hoping would take it (woot!). The ole memoir is completely restructured now. (Aren’t you sick of hearing about that dang thing?) And I organized my send-out pieces. Three months ago I thought I had nothing left, but I’ve rewritten poems and prose pieces and feel I have some offerings to the world. I hope you enjoyed Carol Bachofner’s pieces. Years ago, Carol was my student, not for creative writing, but for literature. She was a fabulous student, the kind of student all teachers wish for: passionate and smart and logical and creative. And hard-working. Are you wondering how Perry is doing? hahaha He’s driving everyone crazy, but he’s so darn sweet. Kana and Felix figured out if they lie on the cat trees by the glass doors, I can put the drapes around them, and Perry can’t get to them. He knows they are there, but it makes it too difficult for him to climb on them. That is Felix on our left, looking out. You can see his little face in the door. Kana is the black shape on the right side. From the inside of the house, Perry and I can only see the drapes. If we don’t do this with the drapes, this is what happens. Perry climbs right up with Felix and within a few seconds he starts to annoy! Perry got to stay up after 10PM for several nights last week because he is so good! The only trouble is that he has to have his bedroom door shut at night because no matter how I wrap the sheet over the gate, he can figure out how to get out. The little smartypants.